In the glory days of the shoegaze boom there seemed to be 2 types of shoegaze bands: those that favored melody first and noise second, and those that flipped that equation. If you're gonna peg Joanna Gruesome as shoegaze -- (and it's not exactly a huge stretch to do that, though they defy that tag in many ways, as we will see) -- then they are clearly in the camp with bands who favor a good hook over a good riff. Which is a way of saying that for all the glorious racket on the new Joanna Gruesome record, there's also a helluva lot of melody. Peanut Butter, out this week on Slumberland Records, is a collection of 10 scorching cuts, all full of feedback and memorable melodies. Fuzzy and catchy, the tunes here on Peanut Butter are sharp, superb examples of the sort of music that few can pull off successfully without looking like mere shoegaze revivalists. "Last Year" rides in on a pure Bikini Kill wave of aggression before the blissed out chorus takes thing in a whole 'nother direction. What starts as primal riot grrl ends as archetypal Slumberland. And that makes perfect sense to this listener. "Jamie (Luvver)" is more of that Black Tambourine-sorta goodness while "Honestly Do Yr Worst" nods in the direction of Bis on what are ostensibly the verses while the influence of BT reers its head elsewhere in the song. The push-and-pull between the two styles makes this a complex cut that still comes in under the 2-minute mark. Joanna Gruesome can cram a lot into 120 seconds and there's little fluff on Peanut Butter. Nothing wasted and everything gained as a result. "There is No Function Stacy" has a propulsive undercurrent which makes one think fondly of forebears like Rocketship while "Crayon", the longest song on Peanut Butter, offers an expansive sound on the guitars while there's the sort of crunch in the mini-rave-ups that seems like the Velocity Girl template updated for the 21st century. "I Don't Wanna Relax" marries an opening blast of Sonic Youth-style feedback workout with early Stereolab rhythms (complete with organ figures). "Jerome (Liar)" melds those shouty vocals to punkier drumming while "Separate Bedrooms" is cooing, early MBV-esque awesomeness. "Psykick Espionage" boasts an awesome title which makes me, kenixfan, recall the Kenickie cut "Psychic Defence". This tune, one of the clear highlights of Peanut Butter, is an infectious racket that veers between a woozy tunefulness that nearly goes off the rails and vocals that anchor things to a more grounded Punk-with-a-capital-P tradition. The album closes on "Hey! I Wanna Be Yr Best Friend" which ramps things down a bit but only for those closing moments. Here on Peanut Butter Joanna Gruesome are not re-inventing the wheel but they are taking a few recognizable indie pop devices and refitting them for modern listeners. The genius of this band on this record is the ease and economy with which they blend about 20 different familiar bits in each cut. Far too punchy to be lumped in with other Kevin Shields clones, and too interested in the tripped out edges of melody to be called anything close to riot grrl, the guys and girls in Joanna Gruesome are boldly bridging genres here in an effort to deliver maximum pleasure as quickly as possible. Fuzzy, poppy, and full of hooks like the tunes of The Ramones, The Primitives, or Helen Love, the songs of Joanna Gruesome are things at once familiar and fresh. Nearly every track on Peanut Butter is a textbook example of how to create pure joy for a listener. Peanut Butter by Joanna Gruesome is out this week on Slumberland Records, or Fortuna POP! outside the United States. 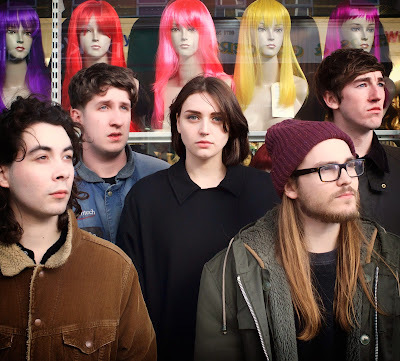 Follow Joanna Gruesome on their official Facebook page.